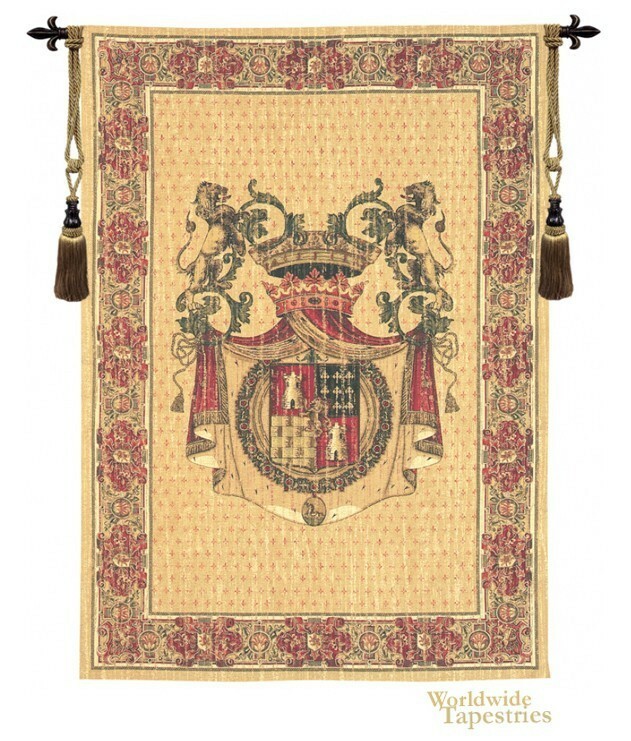 This royal crest tapestry honors the family name of Tours, which means “turns” in French. With a lineage that dates to the 14th century, the origin of the name “Tours” can be traced to the ancient city of Tours, France. The chief of France had granted the aldermen of the city the right to be represented in the court of kings, one of 36 communes in ancient France to be considered good communities, and worthy of the king’s ear. The town is perhaps most well known for its ties to Joan of Arc, who wrote of the voices she heard while in Tours. This tapestry features the coat of arms for the Tours family. Two lions frame a crown, banner and robe, all representative of the family’s role in French history. This Chenille tapestry comes unlined and has a rod sleeve for easy hanging. Note: tapestry rod and tassels, where pictured, are purchased separately. Dimensions: W 54" x H 76"